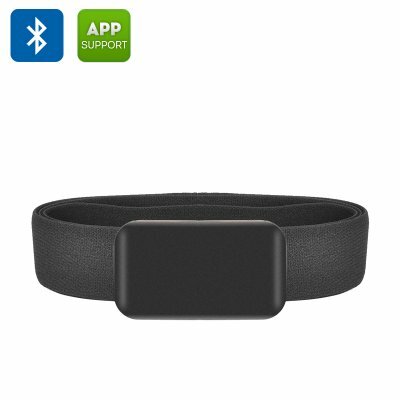 Successfully Added Bluetooth Heart Rate Monitor 'Smart Pulse' - Adjustable Chest Strap, Android + iOS Support, Removable Battery to your Shopping Cart. Chest strap Bluetooth heart rate monitor for accurate readings of how intense your workout was. If you're looking for a multi sport accurate heart rate monitor that can work with Android or iOS devices then the 'smart pulse' is the perfect fit. Designed for gym rats, runners and cyclists the 'Smart Pulse' chest strap heart rate monitor is more accurate than the optical heart rate monitors that come on watches or fitness bands and as it located right next to your heart there is no delay in reading bpm. Unlike wrist mounted sensor this heart rate monitor won't be effected by sweat or lighting and is held securely in place for faultless fitness readings. Keeping track of your vitals and transmitting them via Bluetooth 4.0 to you Smartphone the 'Smart Pulse' can work with a number of Android or iOS devices using apps such as Polar Beat, ALA COACH and NRF UTILITY. With an accurate bpm heart rate measure you can see how intense the workout was and measure your fitness in a range of activities. The soft, elasticated strap fits snugly around your torso and is easily fastened with a simple hook. Adjustable for most body sizes this lightweight and comfy wireless heart rate monitor is certainly one for the fitness community and makes the perfect training companion. The 'Smart Pulse' Heart Rate Monitor comes with a 12 months warranty, brought to you by the leader in electronic devices as well as wholesale fitness gadgets..